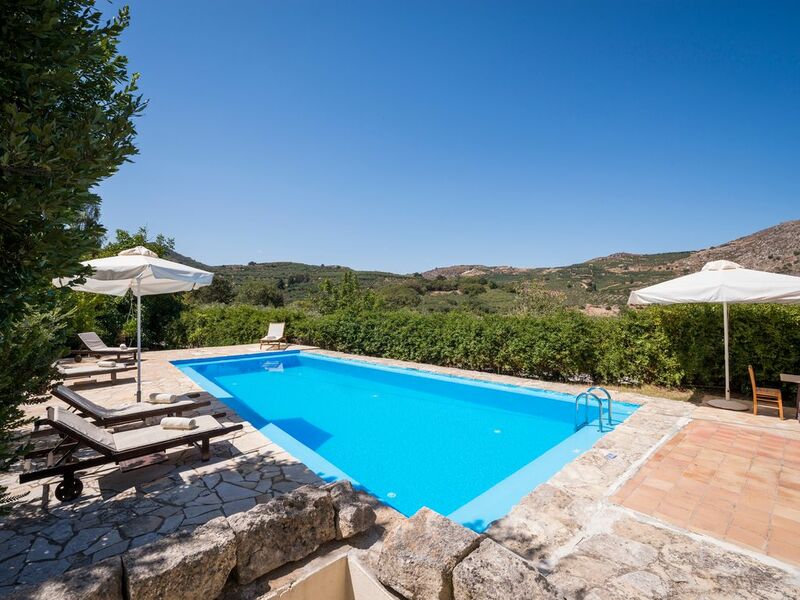 The historical, aristocratic house 'Anagnostis' surrounded by olive groves is situated in the village of Deliana, 15 minutes from the sandy beaches and 30 minutes from the town of Chania. This Neo-Classical house was built in 1886, carefully restored as to preserve its characteristic ninteenth-century architecture.Today the house combines the ambient of the past with the modern facilities of today, it offers at the first floor 4 bedrooms and 3 bathrooms. The central and welcoming dining room was ever since the family room of the house and is filled with evidence of the families adventure spirit. Family photographs and handmade curtains cover the surface in the 4m high living room. From the separate ground floor unit with its fully equipped kitchen and additional bathroom you can step out into the garden with separate pool area. 1500m2 of wonderful surroundings, ultimate comfort, privacy, these are the features of this private home. The local restaurants near by, are an other highlight. Quiet and peaceful, beautiful cretan village. If you like to meet the real cretan life and feel part of it, you will love this place. The accommodation can be used for a family vacation or a group of friends. If you are looking to 'switch off' for a few days or weeks, recharge batteries, witness nature and find inner peace, this is the place for you. The village of Deliana on the western part of the island of Crete, 35 km from Hania, only a 40- minute drive from the city and you are in your private garden of Eden. Nearby there is a beautiful gorge where one can go hiking and enjoy the wild unspoilt Cretan nature. The village offers 3 tavernas and one coffee shop. Even Greek people from Hania, come on the weekends to enjoy the tasty dishes the owners offer. Our guests enjoy the warm and special care of Pagona, our maid. She knows, how to take care of the guests and make them feel at home. Ask for the weather in Crete, every January, during approximately the last 14 days of the month, we have very warm weather, about 20 - 25 degree Celsius. It seems, like spring has already started. We call this the 'powerful' days of the winter. Our satisfied clientèle is our best advertising.